Bringing audio video dreams to life since 1978. 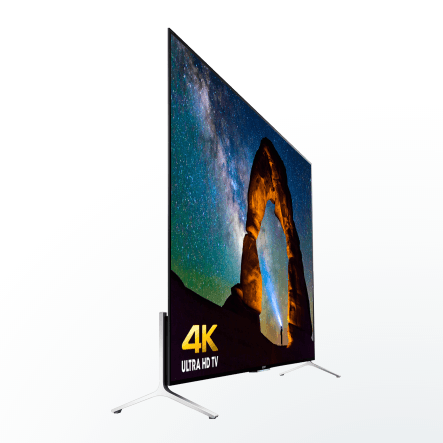 Sony’s at the Top of the 4K Game! The newest Sony X900C series this year is an outstanding new addition to their 4K canon. These televisions come ranging in size from 43” to 75”, and are the thinnest televisions available in the world. The tops of the televisions are 5.08mm-7mm thick, and they have a slight bulge at the bottom to accommodate the internal working parts. Some reviewers have complained about the bulge at the bottom, but these amazing TVs still mount almost flat on the wall, and are thinner than your typical smart phone. So what is inside these TVs that makes them so amazing? It all begins with an X1 processor engine that has high dynamic range (HDR) capacity. This HDR capability puts Sony ahead of their competitors, and their continued use of the Android TV platform operating system means that they will continue to be on the cutting edge. The voice search feature is a very nice addition as well. Sony’s partnership with Android means that customers have full access to the Google Play store, as well as programming from Netflix, Amazon Instant Video, YouTube, Hulu, CBS News and Sports, Pandora and SlingTV. Naturally, Sony X900C TVs are still compatible with Google Chromecast, so you Apple users will still be able to use its voice search and display from their Apple products as well. The inside of the television is impressive, but what goes above and beyond the expectations that you might have, is the new technology that is on the outside. The new X900C series TVs have vanishing edge technology, which means the picture goes almost to the very edge! There is so little bezel that you will hardly even notice! This display makes for an outstanding viewing experience, far superior than the much-beloved curved TVs on the market right now. Adding to the amazing display is the color-enhancing Triluminous Display technology unique to Sony, which has color correction including dimming hues to make them more realistic. Finally it should be noted that there is local dimming on the X930C & X940C but not on X900C. All in all, this new X900C series is a great improvement in the evolution of 4K TVs. With price points from $1,300-8,000, there is a size right for your home theater budget. Copyright 2019, Home Theater Solutions.